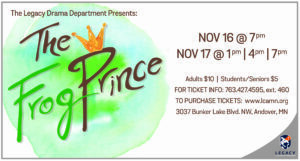 Each Fall, Legacy Christian Academy’s Advanced Drama class performs notable, often classic plays. These dedicated students are advanced in acting/performing skills and often put in hundreds of hours of rehearsal in order to produce magnificently moving shows. Past performances have included C.S. Lewis’ The Screwtape Letters, Shakespeare’s Hamlet, The Crucible, Pride and Prejudice, The Scarlet Letter, and Rebel Without a Cause. 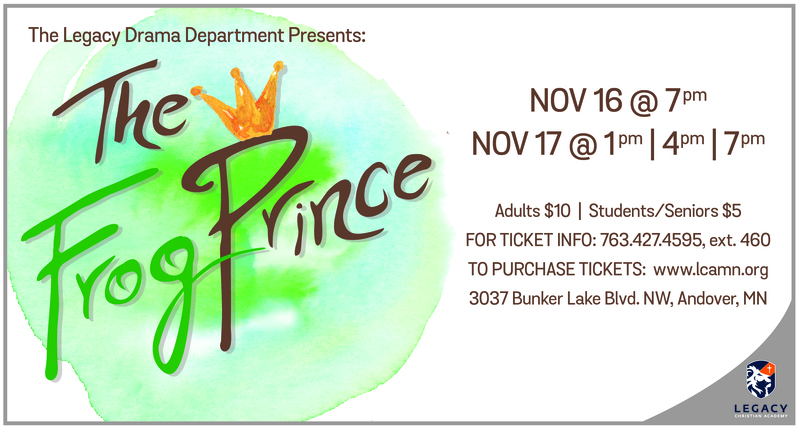 “The Frog Prince” is a hilarious tale adapted from The Brothers’ Grimm fairy tale called The King’s Daughter and the Enchanted Prince. It is about a princess who loves her golden ball. She meets a prince in the forest one day who is very arrogant and very self-absorbed. Because he is unkind, a hag turns him into a frog. The only way to free himself of his frog-ness is to be kind to the princess so that she will invite him back to her castle to be her companion for her birthday celebration. The princess goes back to the forest and loses her golden ball. The Frog Prince ends up getting her golden ball back for her, and she reluctantly promises to let him join her birthday feast. Chaos and hilarity ensues when he shows up at the castle and his kindness shows that he is ready to become a prince again. But does he? Bring your family and friends for this wonderfully charming tale of how love prevails! You may purchase tickets ONLINE 24/7 after the sale open date or through the LCA Box Office Monday-Friday 7:00 am-3:30 pm. The Box Office accepts cash or check only.